Although this single was released in 1975, it still sounds rather modern. But that's only because Joy Fleming uses the same repulsive singing techniques people like Mariah Carey and Leona Lewis still employ these days: singing like there's a kidney stone in your gut. 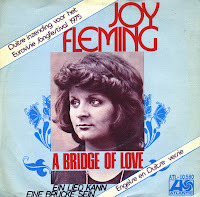 'Ein Lied kann eine Brücke sein' (this single contains both the English and German versions) was the German entry for the 1975 Eurovision Song Contest. The song finished 17th in a field of 19 competitors. Despite this disappointing result, Fleming returned to the German national final three times: in 1986, 2001 and 2002. None of these resulted in a comeback on the international Eurovision stage.